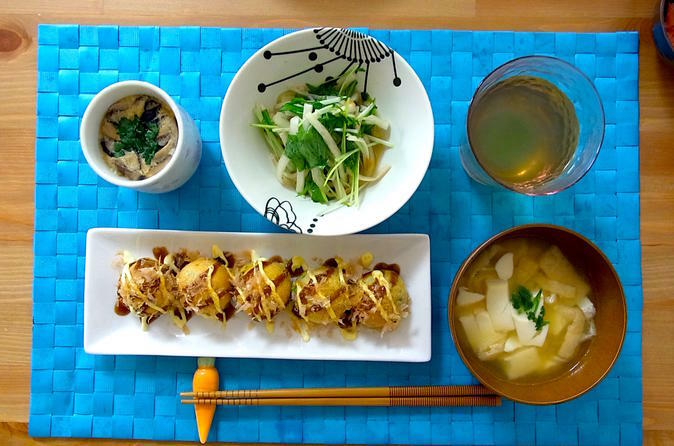 Join Hiro in her small kitchen and learn to make traditional Japanese dishes from scratch. Hiro will welcome you into her cozy apartment with a warm hug before serving you a cup of refreshing tea. You will be taught to make authentic Japanese dishes like okonomiyaki (savory pancake) or gyoza (dumplings) and learn about Japanese food and culture from a local. As Hiro's kitchen has limited space, you will do some of the prep work outside in the dining area, and use the kitchen stove for the final cooking. Your cooking experience will last about an hour before you sit down together to enjoy the meal you helped prepare and chat with Hiro and her roommate, if she's present, about local cuisine and culture. The menu might include dishes such as takoyaki (octopus in fried dough), nikujaga (traditional Japanese slow-cooked meat and vegetable stew), chirashi-sushi (sushi rice with colorful scattered toppings) or chawan-mushi (soft and tender steamed egg and vegetables in a cup) served with miso soup. Let Hiro know when you make your booking if there is a particular dish you'd like to try. Please note, this is not a commercial cooking class, rather this experience is a visit into a Tokyo home to meet a local who is an expert cook, and share Japanese culture and cuisine together.